The record is made up of 1 b&w silver gelatin Principal photographic process for black & white photography from the 1870s. print. It was created in Dec 1916. It was written in English. The original is part of the British Library: India Office The department of the British Government to which the Government of India reported between 1858 and 1947. The successor to the Court of Directors. Records and Private Papers. This scene, likely taken from on board ship, shows five dhows with two-lateen sail rigs at anchor at Karachi. 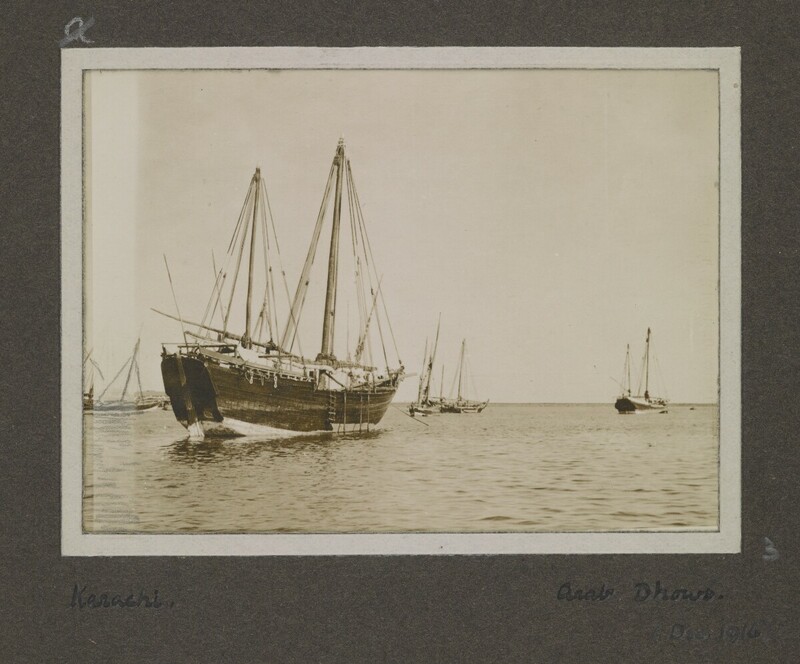 The dhow nearest to the camera has both of its sails stowed. A rope ladder hangs over the starboard beam end. The anchor chain can be seen afore the bow of the vessel. In the distance, along the horizon, land can be seen. Damaged film, printing error or a light leak has caused a very slight band, most discernible in the lower edge of the left of the image. Graphite pencil appears to have been applied to the print over this area.